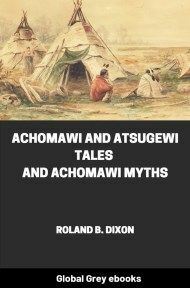 A short collection of tales and myths of the Achomawi and Atsugewi, who lived in the north-eastern Sierra Nevada of California. 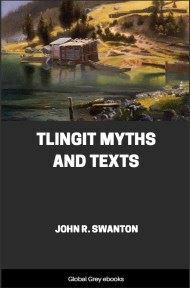 Chapters include; Creation Myth (Achomawi); The Making Of Daylight (Achomawi); Hawk-Man (Achomawi); Search For Fire (Achomawi); Loon-Woman (Achomawi); The Lost Brother (Achomawi); Bluejay And Lizard And The Grizzly-Bears (Achomawi); Silver-Fox And Coyote (Achomawi); The Mole And The Sun (Achomawi); Coyote And Cloud (Achomawi); Creation Myth (Atsugewi); Flint-Man, The Search For Fire, And Loon Woman (Atsugewi); Pine-Marten Marries The Bead Sisters; Kangaroo-Rat Races With Coyote And Others; The Buzzard Brothers And Wood-Worm; The House Of Silver-Fox; and, Fish-Hawk And His Daughter. In the beginning all was water. In all directions the sky was clear and unobstructed. A cloud formed in the sky, grew lumpy, and turned into Coyote. Then a fog arose, grew lumpy, and became Silver-Fox. They became persons. Then they thought. They thought a canoe, and they said, "Let us stay here, let us make it our home." Then they floated about, for many years they floated; and the canoe became old and mossy, and they grew weary of it. "Do you go and lie down," said Silver-Fox to Coyote, and he did so. While he slept, Silver-Fox combed his hair, and the combings he saved. When there was much of them, he rolled them in his hands, stretched them out, and flattened them between his hands. When he had done this, he laid them upon the water and spread them out, till they covered all the surface of the water. Then he thought, "There should be a tree," and it was there. And he did the same way with shrubs and with rocks, and weighted the film down with stones, so that the film did not wave and rise in ripples as it floated in the wind. And thus he made it, that it was just right, this that was to be the world. And then the canoe floated gently up to the edge, and it was the world. Then he cried to Coyote, "Wake up! We are going to sink!" And Coyote woke, and looked up; and over his head, as he lay, hung cherries and plums; and from the surface of the world he heard crickets chirping. And at once Coyote began to cat the cherries and the plums, and the crickets also. After a time Coyote said, "Where are we? What place is this that we have come to?" And Silver-Fox replied, "I do not know. We are just here. We floated up to the shore." Still all the time he knew; but he denied that he had made the world. He did not want Coyote to know that the world was his creation. Then Silver-Fox said, "What shall we do? Here is solid ground. I am going ashore, and am going to live here." So they landed, and built a sweat-house and lived in it. They thought about making people; and after a time, they made little sticks of service-berry, and they thrust them all about into the roof of the house on the inside. And by and by all became people of different sorts, birds and animals and fish, all but the deer, and he was as the deer are to-day. And Pine-Marten was the chief of the people; and Eagle was the woman chief, for she was Pine-Marten's sister. And this happened at Ilā'texcagēwa. And people went out to hunt from the sweat-house. And they killed deer, and brought them home, and had plenty to eat. Arrows with pine-bark points were what they used then, it is said, for there was no obsidian. And Ground-Squirrel, of all the people, he only knew where obsidian could be found. So he went to steal it. 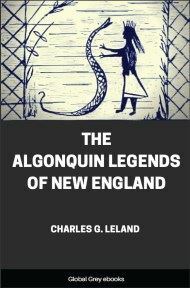 To Medicine Lake he went, for there Obsidian-Old-Man lived, in a big sweat-house. And Ground-Squirrel went in, taking with him roots in a basket of tules. And he gave the old man some to eat; and he liked them so much, that he sent Ground-Squirrel out to get more. But while he was digging them Grizzly-Bear came, and said, "Sit down! Let me sit in your lap. Feed me those roots by handfuls." So Ground-Squirrel sat down, and fed Grizzly-Bear as he had asked, for he was afraid. Then Grizzly-Bear said, "Obsidian-Old-Man's mother cleaned roots for some one," and went away. Ground-Squirrel went back to the sweat-house, but had few roots, for Grizzly-Bear had eaten so many. Then he gave them to the old man, and told him what the bear had said about him, and how he had robbed him of the roots. Then Obsidian-Old-Man was angry. "To-morrow we will go," he said, Then they slept. In the morning they ate breakfast early and went off, and the old man said that Ground-Squirrel should go and dig more roots, and that he would wait, and watch for Grizzly-Bear. So Ground-Squirrel went and dug; and when the basket was filled, Grizzly-Bear came, and said, "You have dug all these for me. Sit down!" So Ground-Squirrel sat down, and fed Grizzly-Bear roots by the handful. But Obsidian-Old-Man had come near. And Grizzly-Bear got up to fight, and he struck at the old man; but he turned his side to the blow, and Grizzly-Bear merely cut off a great slice of his own flesh. And he kept on fighting, till he was all cut to pieces, and fell dead. Then Ground-Squirrel and Obsidian-Old-Man went home to the sweat-house, and built a fire, and ate the roots, and were happy. Then the old man went to sleep. In the morning Obsidian-Old-Man woke up, and heard Ground-Squirrel groaning. He said, "I am sick. I am bruised because that great fellow sat upon me. Really, I am sick." Then Obsidian-Old-Man was sorry, but Ground-Squirrel was fooling the old man. After a while the old man said, "I will go and get wood. I'll watch him, for perhaps he is fooling me. These people are very clever." Then he went for wood; and he thought as he went, "I had better go back and look." So he went back softly, and peeped in; but Ground-Squirrel lay there quiet, and groaned, and now and then he vomited up green substances. Then Obsidian-Old -Man thought, "He is really sick," and he went off to get more wood; but Ground-Squirrel was really fooling, for he wanted to steal obsidian. When the old man had gotten far away, Ground-Squirrel got up, poured out the finished obsidian points, and pulled out a knife from the wall, did them up in a bundle, and ran off with them. When the old man came back, he carried a heavy load of wood; and as soon as he entered the sweat-house, he missed Ground-Squirrel. So he dropped the wood and ran after him.